The proposal is done and dusted and the date has been set. While there are no shortage of wedding timelines available online, there hasn't been any to take care of the jewellery preparation department. Unless you are planning to get your wedding bijoux off the shelves, it is worth getting a timeline organised and included into the overall wedding schedule. Everyone knows the deal about booking your hotels and caterers way in advance to get your ideal date and location - likewise with the popular photographers and videographers whose schedules fill up faster than you can imagine. Preparing for your wedding jewellery and accessories should not be an afterthought, in fact, you should start thinking about them as soon as you have your wedding theme and dresses settled. In this post, we breakdown the months leading up to your big day and how your wedding jewellery preparation should fit into that timeline. During this period, you should have your wedding theme, colour scheme and general aesthetic nailed down. If you like window shopping, this period will be a lot of fun. From picking a location, vendors, and choice of dress, there are an assortment to select from. Picking out a wedding dress now is crucial though, as it will most likely set the aesthetic tone of your event, in turn affecting your choice of wedding bands and other bridal accessories to be worn on the big day. Take this chance to narrow down your choices for your wedding jewellery brands and make several appointments with the boutiques to get a sense of their products and services. This is the best time to explore the various jewellery possibilities and make a list of what jewellery you'll need to procure. 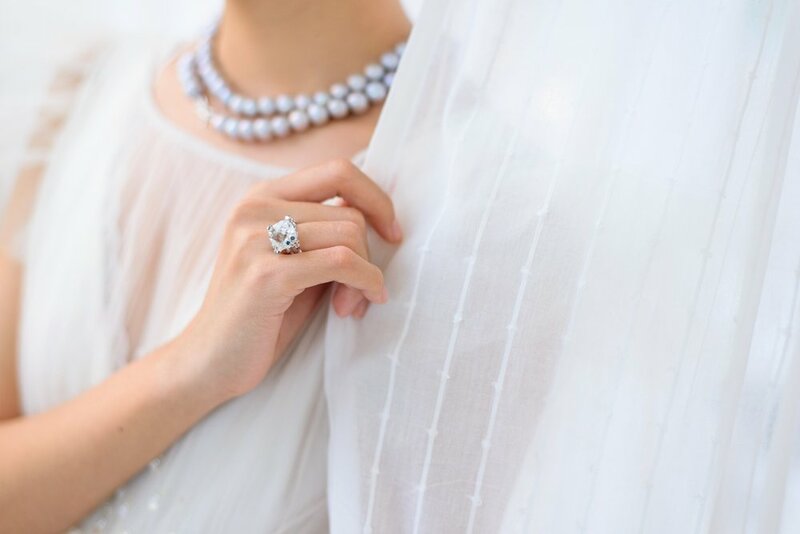 At Choo Yilin, we will be more than thrilled to introduce to you our exquisite pieces and provide a holistic and informative Si Dian Jin 四点金 consultation tailored to each unique individual bride and family. Feel free to make an initial appointment with us at our Mandarin Gallery store here. By now, you should've already decided on your wedding jewellery vendor after visiting a few boutiques and finding one that best suits your aesthetic tastebuds. The next crucial thing you'll need to think carefully about would be your budget, the specific designs as well as the number and type of pieces you intend to get made. Do you need bridal accessories for the extra touch of glamour on the big day? Or are you looking for a full Si Dian Jin set? If you're looking at customising a full Si Dian Jin set in solid gold with us, this is where you have a warm cup of tea and sit down with our friendly Personal Shoppers to pick out your very own raw jade bangle from our jade bangle library along with the design of your choice. You can view our various jade bangle designs here. The process of customising a jade bangle with us at Choo Yilin gives you the autonomy to pick and curate your piece from a scratch. Every little detail from the types of gemstones to the metal plating can be customised and tailored to your personal preference. As each piece is truly bespoke, we recommend placing all Si Dian Jin orders 3 - 4 months in advance to ensure that you have ample time for our craftsmen to start on your masterpiece. Things are starting to come together and the clock is ticking. After months of hair and make-up trials, a stylist makes the cut, vendors are approved and invitations printed and ready to be mailed to your guest list. On the jewellery front, your jewellery trousseau is currently in the works. During this time, our artisans are working tirelessly behind the scenes to ensure that your wedding jewellery looks nothing short of stunning as we craft your exquisite pieces and set your gemstones in, one at a time. Are you getting the butterflies yet? As the day nears, you may start feeling the jitters. Fret not though. Since you've been following a timeline, things should fall nicely in place. With the majority of the things taken care of in sequence, all that's left will be the final dress rehearsals. Your dream jewellery will be ready by now, and packaged beautifully for your pick-up. Just wait for our phone call and be prepared to be come face-to-face with some of the most important jewellery pieces in your life. So there you have it, a simple timeline to guide you as you navigate the wedding planning process. No matter how overwhelming it gets, take time to stop and smell the roses. Soak up this beautiful experience and don't forget what lies at the bottom of it all - to revel in your beautiful love story and the celebration of a life-long union with your best friend and soulmate. 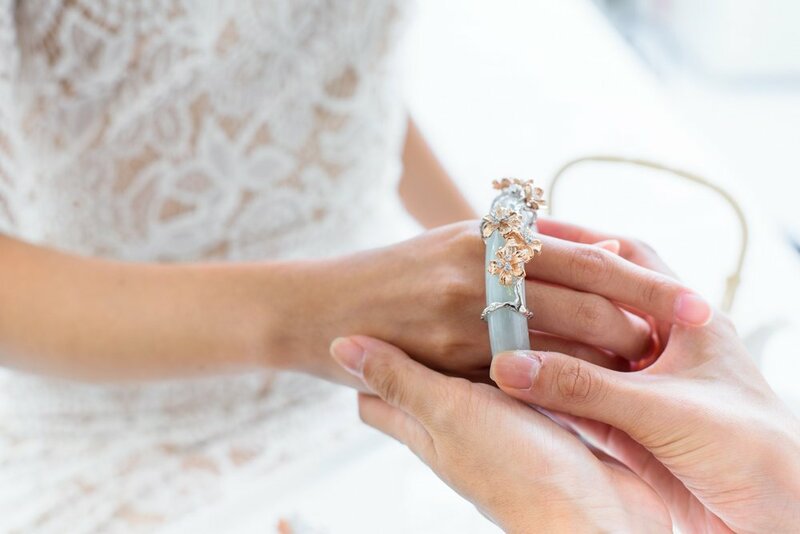 If you need any additional help, we've covered various wedding topics for you to browse such as all you need to know about Si Dian Jin, a guide to picking the perfect bouquet and the significance of wearing jade on your wedding day.